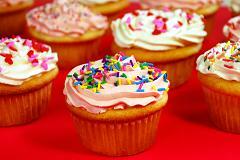 This recipe for Vanilla Cupcakes is fool-proof! I love easy-to-follow recipes and I particularly love recipes where all the ingredients are put in the bowl at the start. I used to only make half of this vanilla cupcake recipe but found it was never enough as the kids always came back for more ... and more. So these are the quantities I use now. I always think vanilla cupcakes are perfect to butterfly. You can either use lemon curd and cream or jam and cream as a filling. They then only need a light dusting of confectioners (icing) sugar to become a perfect morning or afternoon tea treat. Place all ingredients in the bowl of an electric mixer and beat on medium speed for 4 minutes, until the cake mix is smooth. Line two 12-hole patty cake tins with paper cases. Spoon the cake mix in to the paper cases until they are three-quarters full. Bake for 12-15 minutes, or until the cakes have risen and are golden and remove from the oven to cool.